A few weeks ago the handle of the front door of the house started to get loose. At the time, I somehow managed to pull off the interior knob and get a look at the mechanism, but my efforts to fix the problem didn't work. 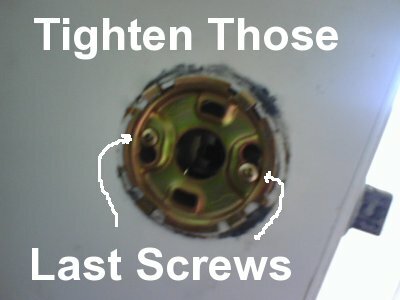 So today when I got up I decided I was going to fix the front door, so help me FSM. I also decided to document the thing so I know how to fix it next time. 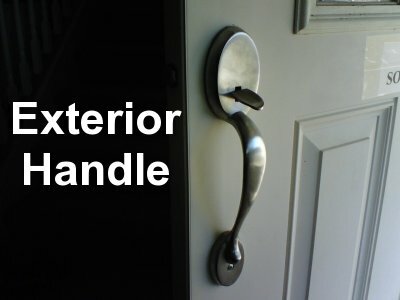 First off, I determined that the handle was a Kwikset, and that there is supposed to be a really easy way to take off the knob. Getting the cover off the plate was easy, but getting the knob itself off the door seemed impossible. Can you see the arrow on the bit that's flush against the door? All the instructions I could find said that all I needed to do was push it down and the knob would come off. But no matter how I tried it didn't work. 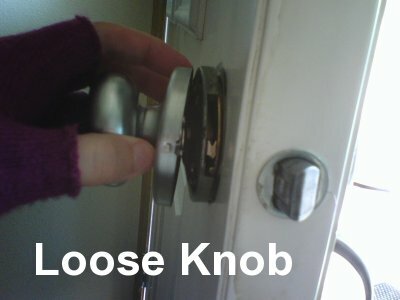 In frustration I started wiggling the doorknob. I turned it one way, and then the other, and kept working on it hoping to get the knob off somehow. 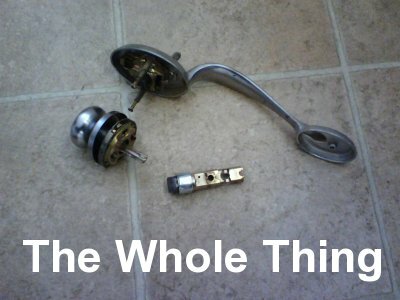 To my surprise and shock, the knob eventually popped off. Once I got the knob off, the rest of the handle assembly came off without any difficulty. It was a mess, but at least I could see all the parts finally without having the door itself in the way. I stuffed a rag in the hole the assembly left in the door, set up the card table, and started to work out just how to fix the stupid thing. 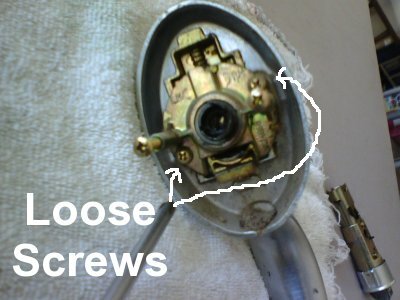 It was pretty easy to figure out why the handle's thumb latch was so loose. There are four screws on the back of it, and two of them hold the thumb latch steady. 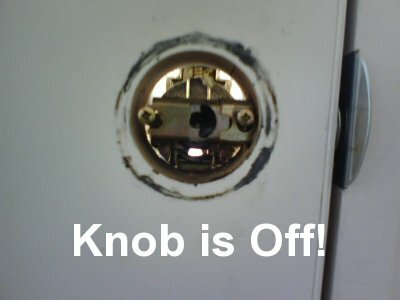 So I tightened those screws up, then turned my attention to the knob. The knob was loose because I couldn't reach those two screws on the handle section to tighten them when the sections are against the door. In order to get to the screws, I'd have to get the plate off the knob assembly. But no matter how hard I tried, the stupid plate wouldn't come loose. I pulled, twisted, turned, flipped the arrows up and down, and eventually figured out that when the arrow was down close to the edge the plate was more loose... but it wouldn't come off. Finally I tried to push the arrow a little further, since there was a tiny space between the arrow point at the edge of the plate it was near. It was difficult because the arrow was stuck, but eventually I got it to make that final snap, and then the plate just popped right off. In short, the arrow wasn't pushed far enough. 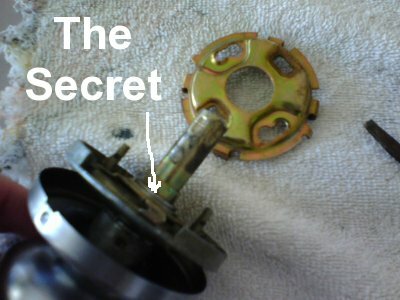 Once I pushed it the remainder of the way, I was able to pull the plate off the knob assembly. The rest was easy. I put the handle back on the door, put the now-loose plate against the other side and matched up the screws with the holes, then tightened the screws to hold it snugly. 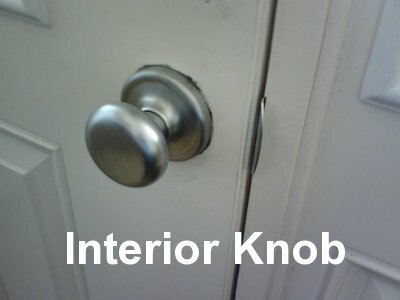 The knob assembly snapped back on the door without any fuss. The latch and the knob are now tight. And if the knob comes loose again, I think I can fix it now without having to spend weeks getting increasingly frustrated with the problem. I'm not the handiest person, but sometimes I have my moments. Now, let's see if Eric notices... *heh* Update: Nope.